M-PRE produces traditional British rock and metal sounds. The card allows wiring as a dual-volume preamp capturing the plexi vibe, or as a master-volume Marshall 800-style preamp for 1970s-era distortion. A modern update of these circuits allows much more dynamic tone control. Two 12A_7s allow tonal diversity. Local supply decoupling is included. Use M-PRE as the distortion channel along with our F-PRE Fender-Style Preamp Kit as a clean channel for the highly sought after Fender-clean plus Marshall-crunch tone combo. Modern shredders can use M-PRE as the rhythm channel combined with our Z-PRE High-Gain Pramp Kit as the lead channel. 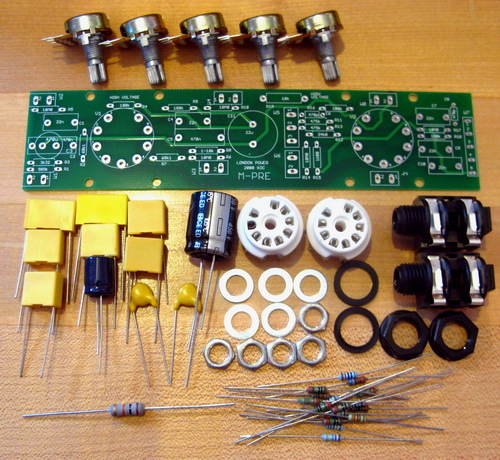 Use our PSU-PRE Preamp Power Supply Kit or similar to build a stand-alone preamp. Combine with our AMP-10 or AMP-25 to build an integrated amp.